With St. Patrick's Day around the corner, it's got me thinking of gold and glitter...and basically anything that you find shining at the end of a rainbow. I spotted these look-alike glitter sandals at Target and thought they were a great steal. They're similar to some of the Madewell sandals as well. What are your plans this St. Patrick's Day? My mom is coming over to watch the baby, and hubby and I are going on a date. Sooo cute Natasha! Love the glitter! What a great deal! We are playing couples bunco with the neighborhood group. Annual tradition. Wow!! That is a steal! Those are adorable! I saw these at Target but was rushing I need to go back and try them on! Happy St Pattys! Wow! The Target version is dead on! Great price, too. 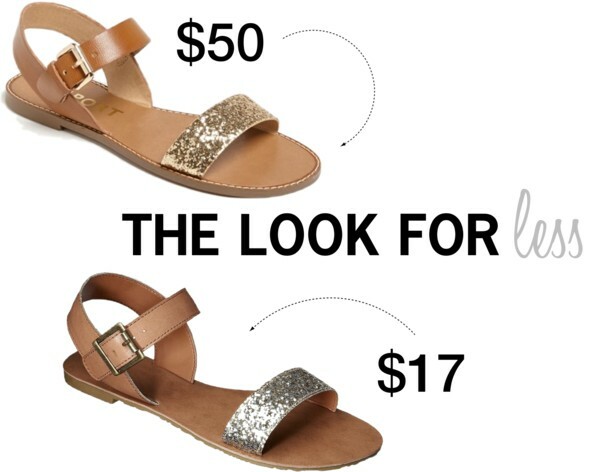 ohmygosh, I cannot wait for sandal season!! Love these glittery cuties. Ooh awesome! Those are just so pretty! I think I'm going to have to take another trip to Target this week to get them :) Thanks for sharing the cheaper version, I love me a good deal! Oh my goodness, I just bought these last week (the Target version)! No wonder I like your taste! And in the post below, my guy has the same onesie Ethan is wearing, too funny!! !